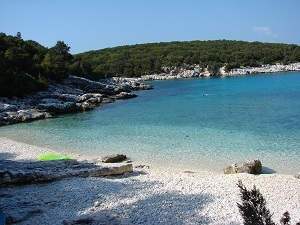 Foki is a fairytale bay close to Agnantia. 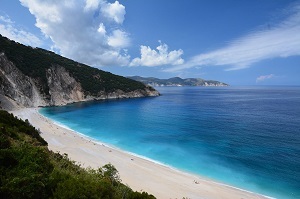 Myrtos beach, approx. 15 km, is a famous pebbled beach. This most attractive deep blue bay every year rightfully wins the prize as being one of the best in Greece and the Mediterranean. You can explore the bays which surround the Agnantia area by car or by renting a small motor boat. There you will be able to see the coastal cypress forest which ends at secluded bays – a truly unique experience. Foki Bay, 2 km. after Agnantia towards Fiscardo, is so narrow that the waters are reminiscent of lake waters and the cypress trees reach right down to the shore. The colors of blue and green combine harmoniously. 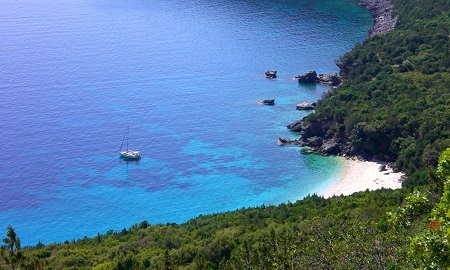 Emblisis Bay, 500 meters west of Fiscardo, is a place where pebbles and sand come together. Alaties Bay, 2,5 km, in the west offers yet another miraculous combination of pine trees and sand. Saint Jerusalem Bay, a beautiful white sand gulf bay just beside Alaties. Dafnoudi Bay, reached from Antipata village, is ideal for nature lovers because you must leave your car at a certain point and walk 15 minutes through the forest to reach this dreamy bay with waters that resemble the color of pool water.